Hello, I'm using Firefox 58.02 (64 bit). Up until the last few days, the password manager has worked just fine. Now, all of a sudden, when I try to log in to the manager it either says it can't contact the server or it says nothing at all and just never logs me in. This is happening in Firefox on multiple computers. The manager works just fine in Chrome. No kidding Sherry, I cant even manually get into my PM via my console. Keep getting an ajaxerror pop up. Earlier in December I sent a Private Message inquiring about the status of the PM and got an " I cant say, but it looks like sometime in January " reply. My subscription is up in a Month and my renewing it pretty much depends on how honest and honorable the suits and ties and skirts are at Webroot. If I buy a dozen eggs at Safeway and the checker breaks a few, I shouldn't be expected to pay for the broken ones AND pay for another dozen, hoping the checker doesn't break em again. The lack of communication and the lack of concern on Webroot part is quite alarming. I'm curious as to what sort of monetary rebate or extended period of time, Webroot sufferers will get for putting up with their Boo-Boo . While completely correct. I would think that a company as smart as webroot would have been able to change the status of a thread on a site they host. But then why would that be so easy when it seems it was to much trouble to send out a mass email on the issue we are all dealing with. Ohhh that right because it was more important to send us an email on how they have an award winning support staff. SMFH!! The only way is to move the new posts to another new thread but that's up to the Webroot Community Staff. I still have not seen a response from webroot about refunds or extended time for those of us who just renewed with hesitation. Can someone from webroot answer this question please? Muddy I realize you take this Thread very seriously and that there is big problems here with PWM. But I do not feel anyone was being cruel. Nothing to do with PWM. Everything to do with bullying a member of this Forum. Which I do not appreciate. At all. For some reason I knew you would use that first line that I posted. I failed to express we were just trying to lighten up this Thread because it has gotten bitter from everyone's statements. It was never to hurt anyone and definitely not to bullie @bjm_. My kudos are mostly saying I have read and like your post. That is me. I dont wznt to get into this with you Muddy because you will see this differently then I do. I have nothing against anyone on this Forum. Least of all trying to hurt anyone. Thank you bjm_ for showing us the legal terms. But who would notice that this document would be all in caps and not think one was yelling. This thread has been a touchy sensitive subject. Simply trying to lighten it up when there's nothing we can do but express our feelings. Thanks for replying to my post, Sherry. But I disagree. I think BJM_ gets picked on in this Forum and unfairly so. I fully accept what you say and that you meant nothing cruel by kudoing that post, but I think it was an uncivil and cruel post. Unless @ROBERT1725 can show otherwise. And I do not think his reply to BJM_ above addresses the tone of his post at all. I have a particular sensitivity to bullying because for several years, I was bullied as a kid, and I will not wear it when I see it inflicted on others. For pete's sake, whenever did I say you said that???? I only have one subject in mind. Bullying. * I simply pointed out that the caps ("shouting") were not BJM_'s but Webroot's. EDIT: I realise, looking again at my post, that the sentence "Oh and by the way Jon, take your complaints to the correct party" was not well phrased and could be open to misinterpretation. I apologise for that. I was trying to say (but obviously expressed myself badly) that your complaint about caps should be addressed not to BJM_ but to Webroot! I never said you did. But it's the ENTIRE reason this whole thing got started, bjm posting the Webroot EULA (which I had no idea would be in all caps, but I'm seriously not surprised). I wasn't speaking about Webroot, just generally. Posting the EULA was not helpful. Come on, Keith. This is not the first time you've misinterpreted my posts and then espoused on it, and you know it. Kudoing a post is NOT bullying, so get off your high-horse. Sorry, but we were never friends. @BurnDaddy wrote:Come on, Keith. This is not the first time you've misinterpreted my posts and then espoused on it, and you know it.. I will agree with you there, Jon. I did recently misinterpret a post of yours, and in a quite uncharitable way. Fortunately I did own up to it the moment you called me out (and you were quite right to call me out). However I really still can't see how this time I misinterpreted you? Well, we seemed to get on in quite a civil and friendly manner in the past. I regret that that no longer seems to be the case. Knowing me, probably my fault . So, can we be friendly, friends or whatever, and civil again?? @BurnDaddy wrote:Kudoing a post is NOT bullying. Sorry Jon, I disagree with you there. Kudoing a post that taunts a poster ad hominem, IS bullying. Muddy7, to agree with a post of mine or to not agree is what a Forum is about. Webster describes Forum as a " medium for open discussion " I cherish the fact that you choose to even read my postings. It shows just how far you have come since being bullied as a child. You should feel proud of your accomplishments in adulthood , others may not have been as fortunate as you have become. I will continue to support your right to express yourself either in script or in spoken word. Looks like I need to remind you all that this thread needs to stay on topic. Please take this other discussion somewhere else or I will move it. Understood...I apologize Lara that we got off topic. Will do.. Thanks, Sherry! We reference this thread when discussing PWM, which makes it all the more critical that it stays on point. I agree as well! Sorry Lara. Lara, seeing that you reference this thread publicly when referring to PWM, I for one would feel very comfortable about your deleting (or, if you prefer, moving) all the messages from Message 164 all the way through to this message of mine. In the light of what you have said, it is important for the public that this thread remains on point and does not give the wrong impression. I believe there is an important lesson to learn here with ALL Password Managers. Always have a backup Password Manager ready to use if something goes wrong. My routine is always having All of my Password Managers up to date and backed up. I not only back up Password Managers I also Print a copy of all the information on the Password Manager and keep it in a safe place. I run Three Password Managers, Webroot, LastPass and Lifetime RoboForm (Non-Cloud). LastPass runs with a login with your Email address. Webroot is the old version of LastPass. 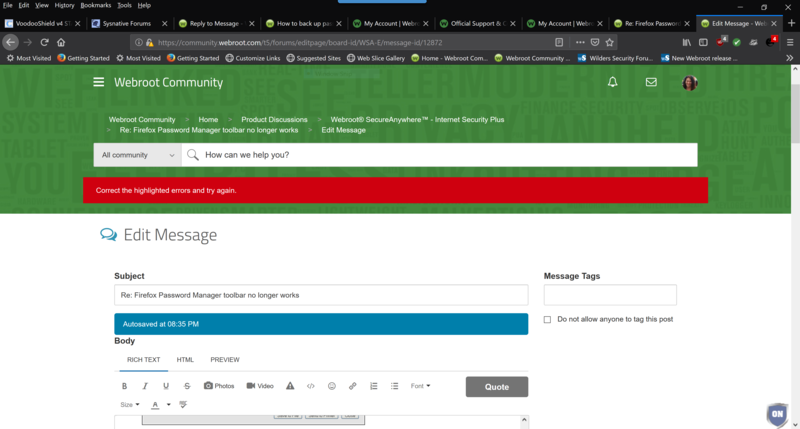 My question is after Webroot fixes their Password Manager, people running both Webroot and LastPass with the same Email address, will those two account interfere with each other? That's a great question, and I'm not sure off hand, so let me ask about it since we have a meeting about PWM later today. My solution is a lot simpler. Use KeePass which stores encrypted passwords locally and is entirely agnostic as to which browser you are using. So they will not interfere with each other. We will have instructions on how you can merge the two accounts should you choose to go that route. If Last Pass or Webroot provides migration (import, export), I'd like to know now also how to do it. That way I can upgrade my browser and just wait until the Webroot saga is settled, then migrate back. Is that something Webroot can provide information on? Do you want to know how to export your passwords? To export data by using the Passwords site: Log in to my.webrootanywhere.com and click Passwords: Under MyIdentity actions, click Export data. From the dialog, enter your SecureAnywhere master password and click OK. The Export Data dialog opens, similar to the example below. In this dialog, you can see all the information for your sites, passwords, and Form Fill profiles. Click Save to File or Send to Printer. If you are saving a file, another dialog opens that allows you to select a file format, then click Export Data. If you are printing, your data is saved to an HTML page and another dialog opens where you can select a printer and click OK.